When you are a business owner, you want to ensure that your business is successful. One of the things that many small business owners don’t understand is that they just can’t do it all. They need to learn how to delegate. Even though you may have started doing so, one of the most important roles within your business is the leader. The truth is that a leader has the ability to ensure that your business is a success. However, he needs to have certain skills. Discover how to create value for your customers. Communication is key in any business, no matter how big or small. A good leader should be able to positively interact with both customers and employees. They should be able to state what is needed from each one of the team members but they need to know how to listen as well. All business owners know that the more motivated their employees are the better for their business. However, and unlike what you may think, motivation doesn’t only come from higher payrolls. It comes from the leader as well. A simple thank you, an encouraging word, a helping hand when in need is sometimes all employees need to be motivated to do a good job. While a leader is someone on who everyone relies on, his time is also limited, And the truth is that there are tasks that the leader can delegate. The truth is that many leaders don’t delegate because they are afraid that they start to be seen as weak. However, when you delegate some of your tasks to other team members, you will not only be able to do a better job on the remaining tasks that you have as you will see staff members improving their skills and becoming more motivated and engaged with the business itself. If you are a leader for some time, you know that being one isn’t easy, The reality is that sometimes you just don’t know what to do or how to react. However, when you are able to maintain positive attitude, you can be sure that things will turn out better. Whenever you have a problem, even if it is a personal problem, you don’t gain anything by being negative. It’s quite the opposite, in fact, Some people believe that by thinking negative, you will be attracting negative stuff. So, just stay positive; realistic but positive. Worried about your time management? A good leader is creative. A good leader is able to look at a problem and think about multiple ways to solve it. While the solution may only be one, the reality is that having a broader perspective of the problem and being able to think about multiple solutions is a gift. 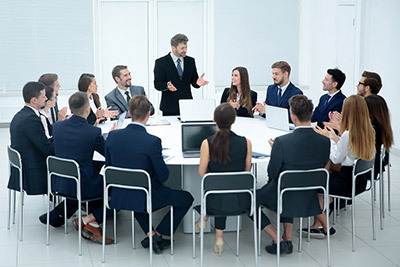 Five ways for project managers to improve their presentation skills.